ERTH Food® is the all-natural, organic, composted fertilizer with super-natural results. It is a unique all-in-one product that provides soil-conditioning organic matter and nutrients in one application. ERTH Food®, unlike other soil amendments and synthetic fertilizers, is rich in organic matter and nutrients and contains microorganisms–the basis for plant growth and animal life–on which we all depend for sustenance. ERTH Food® contains more than just Nitrogen (N), Phosphorus (P), and Potassium (K); ERTH Food® contains the other micro and macro nutrients essential for plant growth, such as Magnesium, Calcium, Iron, Manganese, Copper, Boron, Sulfur, and Sodium. 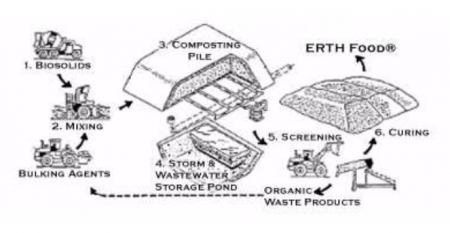 ERTH Food® compost is environmentally friendly–preserving, purifying, and restoring soil and water resources. Because organic matter enhances water and nutrient-holding capacity and improves soil structure, the use of ERTH Food® can enhance productivity and environmental quality and can reduce the severity and costs of natural phenomena such as drought, flood, and disease. ERTH Food® has the US Composting Council’s Seal of Testing Assurance and exceeds the EPA 503 rule as an Exceptional Quality product. ERTH Food® is recognized by the state of Georgia as a nutrient-grade compost and is consistent enough to be licensed in 18 states as an organic fertilizer with a guaranteed NPK analysis of 1.5-0.5-0.5. ERTH Food® is a natural, organic, composted fertilizer with millions of microbes. ERTH Food® preserves water quality by increasing water retention in the soil, reducing the need for water. ERTH Food® purifies soil and water by managing nutrients, improving saline soils, cleaning runoff and stormwater, binding pollutants in soils, and suppressing plant pathogens. ERTH Food® provides a carbon and energy source for soil microbes. ERTH Food® aids the growth of crops by improving the soil’s ability to store and transmit air and water. ERTH Food® retains nutrients by providing cation-exchange and anion-exchange capacities. ERTH Food® maintains soil in an uncompacted condition with lower bulk density, increasing the rate of water infiltration and facilitating penetration of plant roots. The ERTH process recovers biosolids from wastewater treatment. Then, utilizing state-of-the-art technology, this wastewater residue is combined with other organic waste products, such as peanut hulls, and then converted into a 100% natural organic fertilizer and soil amendment. ERTH technology combined with the USDA-approved aerated static pile process produces ERTH Food®. Biosolids are recovered and tested at a wastewater treatment plant, then delivered in specially equipped trucks to the ERTH Food® production facility. There it is weighed and tested once again. The biosolids are mixed with a bulking agent such as peanut hulls. The mixture is then constructed into a mound interlaced by perforated pipes connected to a series of lowers. The compost mound is constantly monitored for its oxygen level, moisture level, and temperature for 21 days. The biological processes heat the pile to 155 degrees Fahrenheit – killing any pathogens, harmful bacteria, and weed seeds. As the pile cools, helpful bacteria begin to multiply, promoting the composting process. The pile is then disassembled and undergoes a screening process in preparation for curing. The now-screened product is cured for an additional 30 days, after which it is shipped to market. RESULT: ERTH Food®–100% organic fertilizer! The organic matter in ERTH Food® acts as a sponge, holding nutrients and water near the roots of the plant and reducing the need to water by up to 50%. ERTH Food® slowly releases organic nutrients into the soil; vital nutrients become available to roots as needed. ERTH Food® improves the physical, chemical, and biological properties of soil. ERTH Food® adds organic matter–not synthetic fertilizer–to lawns and gardens. Application of ERTH Food® reduces the potential for soil erosion. ERTH Food® contains naturally-occurring fungicides and beneficial organisms that help suppress disease-causing organisms. ERTH Food® is pH-neutral, meaning it will neither add nor detract from the acidity or alkalinity of soils. Heat generated during the process of composting ERTH Food® destroys any potential pathogens or weed seeds that may be present. Beneficial effects of ERTH Food® last for years. ERTH Food® is an environmentally and ecologically sound compost product.